Did I just read? I turned the last page of the book, and just sat and stared into space for a little bit. It was a wackadoodle ending, left open in a way that makes you just... well, stare into space for a bit. From the beginning of the story to the end, I wondered if everything that happened to Paige and her family was the work of something sinister, or if Paige had just lost her dang mind. The ending... only cleared things up a tiny bit. I am not sure if I loved it, or if I didn't. It has been over a week, and I still honestly can't answer that question. Paige and her family are moving to Idaho, a little bitty town in Idaho, from California. Her dad, the big time movie maker, cheated on her mom and her mom wants a fresh start. From the moment they arrive in this little town, and move into the big house on the hill, things start getting weird. Paige's little brothers insomnia gets worse and worse. There is a swarm of flies that live in the entryway, never moving, getting bigger every day. And there are spiders. EVERYWHERE. There is one scene, with a dresser, and another with a ceiling... nope, I can't even go there. Ugh! Anyway, things will disappear and reappear in strange places and things multiply... video games, jars of pasta sauce. Paige and her new semi-friend Chloe come to the conclusion that the house is haunted. After some investigation, they discover that the home was once a clinic for a cult called Psychiana. After that discovery is made, things really start to go haywire. Paige and crew do their best to get rid of the bad energy in the house, but when they finally feel like they have succeeded, the worst possible thing happens. People start to die. 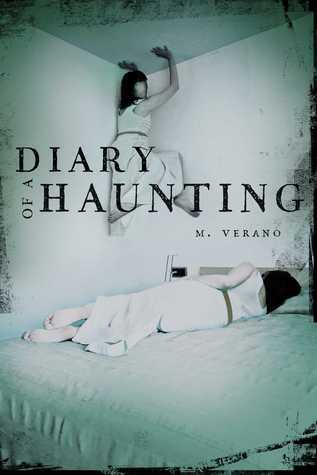 Diary of a Haunting is told through Paige's journal entries. We see everything unfold through her eyes. This was an interesting format, and one that I hope to see again, but it does cause the reader to have some doubts about what might actually be happening. Paige is definitely an unreliable narrator, but she is also easy to feel sympathy for. While I didn't exactly like her character, I felt for her. The rest of the characters we only see through her eyes, and she doesn't always have the best thoughts for them. Her little brother is really the only one that she sees in a positive light, for the most part. He is a typical brother, and I enjoyed his scenes, even the creepy ones. I am not going to write anything about the plot in this review, because most of what I would write could be considered spoilery. This is definitely a story that you have to go into with an open mind, and no expectations. There is definitely a creepy factor to it, which I enjoyed, and the plot of the story was not bad. The pacing was good, and the author did a great job making the journal entries into a consistent story. The ending was a mind trip, that is for sure. I still am at a complete loss. I mean, I got it. But there were a lot of questions left in my head, and it made me wonder if there will be a second book. I don't know if that would be good or bad though... It could answer questions, but it also would take away from the eerie vibe the ending left. I hate it when my reviews sound like a bunch of gibberish, but even after trying to reword it and make it a little less rambling, I am still just... I don't know what to say. If you like mind trippy books with a creepy vibe and endings that won't answer every question, definitely give this one a shot. There are some awesome pics that go with the story! If you have a thing about spiders, like I do, be prepared! Be prepared anyway!